Electronic entry door locks are now common in every household. And it's not only just a door lock but also an automatic door lock system for home. And what is a smart lock? A smart lock is an electronic mechanical digital lock which is designed to perform locking and unlocking operations on a door when it receives such instructions from an authorized device using a wireless protocol and a cryptographic key to execute the authorization process. It also monitors access and sends alerts for the different events it monitors and some other critical events related to the status of the device. Smart security lock can be considered part of a smart home. Smart locks, like the traditional locks, need two main parts to work: the lock and the key. In the case of these electronic locks, the key is not a physical key but a smartphone or a special key fob configured explicitly for this purpose which wirelessly performs the authentication needed to automatically unlock the door. 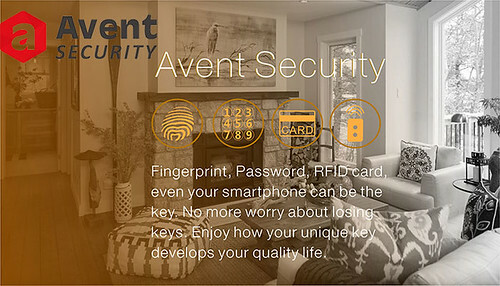 There are 3 types of digital door lock in Avent Security, such as fingerprint door lock, password door lock and smart card door lock. All these locks have the mechanical key which is design for the emergency access. The cutting and replacing keys has become quite a high tech trade. From the needs to prevent the theft of the simple cutting a new set of keys electronic methods. As each of these appeared they needed a legitimate way to reproduce replacement of extra keys. Door lock from Avent Security can solve this problem perfectly. You can use the fingerprint, password, smart card or remote control as the main key to unlock the door. There are no more worry about losing the keys or copies. High tech unlocking method can provide protection throughout the day. By spending 15% of the annual sales into product development, we've believed that innovation is our greatest asset. We are able to solve our customers' problems and meet what they need better than the other competition because everything we've learned has led us to one simple premise – the best service is high quality smart door entry system. After reading this blog, do you want to learn more about us? Please contact us for further information.